Brooklynguy's Wine and Food Blog: La Paulée de...Austria ! About 50 or 60 wine lovers came together to celebrate Austrian wine the other night at Seasonal Restaurant in midtown Manhattan. 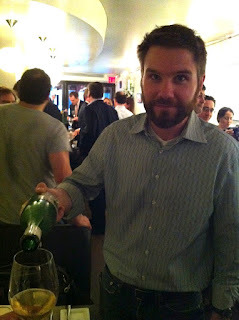 Stephen Bitterolf, the Wine Director at Crush, conceived of this event with an eye towards the famous La Paulée Burgundy dinners where everyone competes to bring the finest bottles and people walk from table to table tasting each others' wines. That's right - Austrian wine, La Paulée style. It takes big bottles to put together the La Paulée of Austrian wine, and Stephen Bitterolf has them. 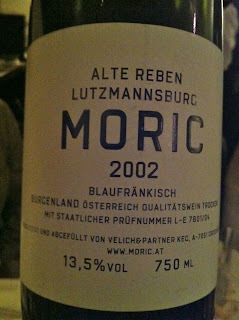 This was an incredible opportunity to drink so many of Austria's greatest wines. Okay, you don't spend an evening with a wine watching it unfold, and for me that's the road to understanding. But I've had barely more than a handful of mature bottles, and still haven't tasted some of the best sites and producers, and this was a great way to delve in a bit further. Importer Carlo Huber and Seasonal Executive Chef Wolfgang Ban. I could be wrong in saying this, but I think that Austrian wine is not something that most people understand, even in the wine-loving community. 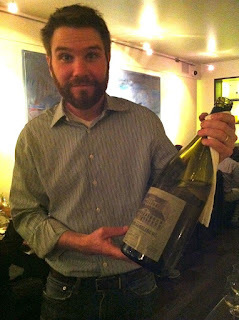 Stephen Bitterolf is a passionate believer in Austrian wine and has for a long time carried a wide selection at Crush, where Joe Salamone and others who work there also believe in the wines. 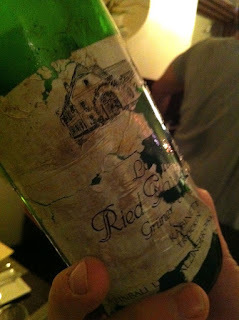 And yes, there are serious collectors in the NYC area who have old bottles stored in their cellars. 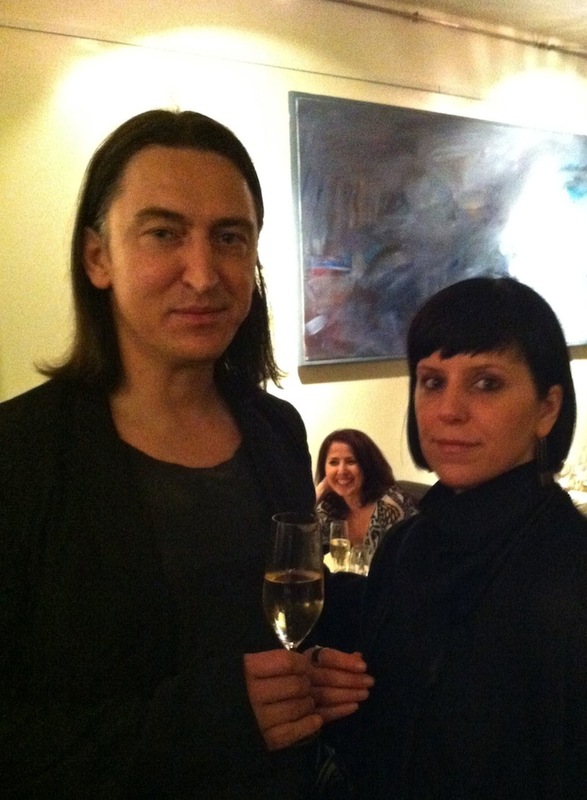 Robert Dentice, a huge collector of Austrian wine, and his partner Renee Patronik. 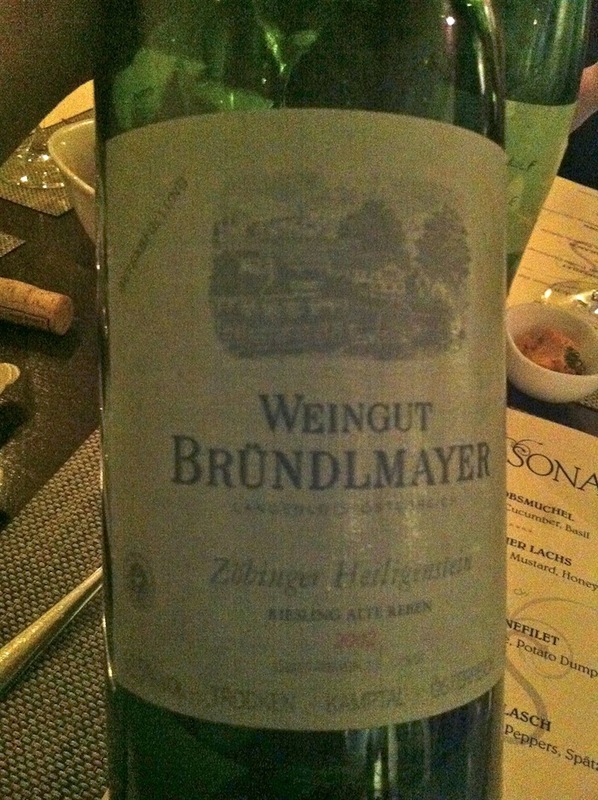 But I see German wines far more often at restaurants and when friends get together. Maybe this is because most Austrian wine is sold in Austria - the wines sell easily, right there at home. Maybe it's because the modern wines are dry, and a lot of Riesling lovers talk about how they prefer their wines to have a bit of residual sugar. It can't be the prices, because it's possible to buy some of the greatest Austrian wines for the price of a villages Burgundy. 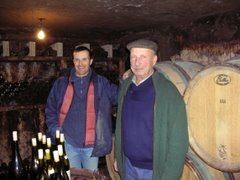 Whatever the reason, the wines are not as mainstream as they should be based on quality, price, and deliciousness. 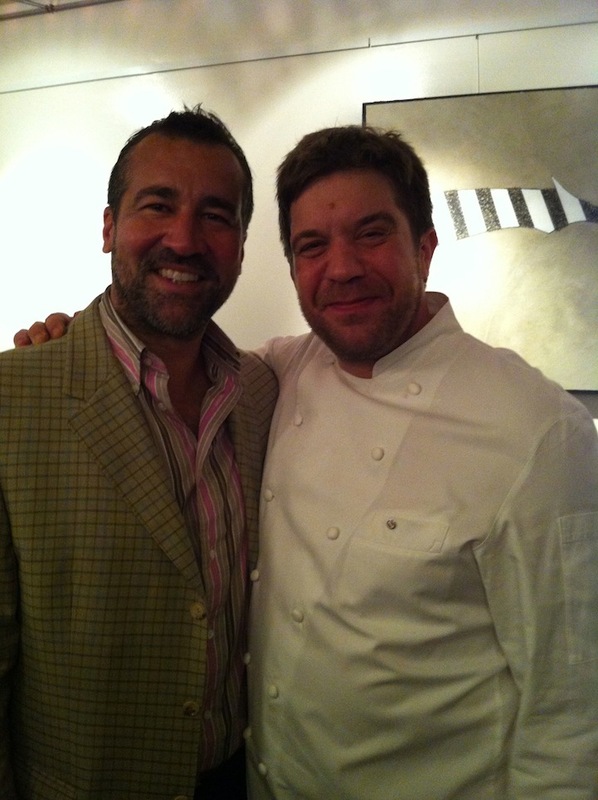 Ray Isle of Food and Wine, and Joe Salamone of Crush, both enjoying Austrian wine. So it was a great evening for Austrian wine lovers, and also an opportunity for some of the great Austrian wines to get some much-deserved attention in NYC. This is why several producers donated rare large-format bottles for the event, and why the Austrian Wine Marketing Board was so helpful in getting those wines quickly to NYC for the dinner. This is why Executive Chef Wolfgang Ban closed Seasonal and used the whole space for the event, and charged only $90 all-in for a fine 4-course meal (full disclosure - I was comped a ticket by Crush because they apparently have mistaken me for a wine writer). 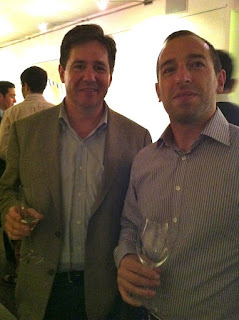 Allan Roth and Gene Vilensky, a couple of guys who love Austrian Riesling. 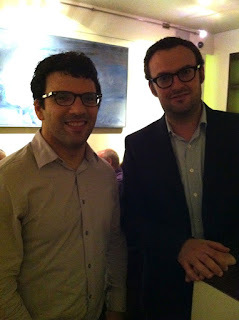 Don't let the wood-framed glasses fool you - they are not Williamsburg hipsters. Allan is in education and Gene is a mathematician. Regular folks like them love Austrian wine too. It was an embarrassment of riches - the wines were great. Not every wine, but I was seriously impressed with so much of what I drank. 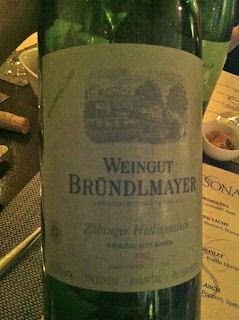 Of the big name Wachau producers, Prager and Knoll seemed to be the most prevalent at this dinner. Most of the other big shots were there too - I saw bottles by Alzinger, FX Pichler, Hirtzberger, and Moric. I saw no Nikolaihof and no Rudi Pichler, which kind of surprised me. From the Kremstal I saw Brundlmayer and Schloss Gobelsburg, but no Hirsch or Nigl. And I don't think I saw anything from the Wagram, which makes sense on a night when people are bringing the fancy bottles. But there is plenty to love in the Wagram (I'm a little bit obsessed with Bernhard Ott right now, but that's another story). Stephen hosted and spent the whole night pouring. I don't think he stopped to eat. 1986 Alzinger Gruner Veltliner Mühlpoint Kabinett Trocken. A designation no longer used. A wonderful old nose. 2002 Bründlmayer Riesling Zobinger Heiligenstein Alte Reben. I've heard Heiligenstein described as the finest site in the Kremstal. 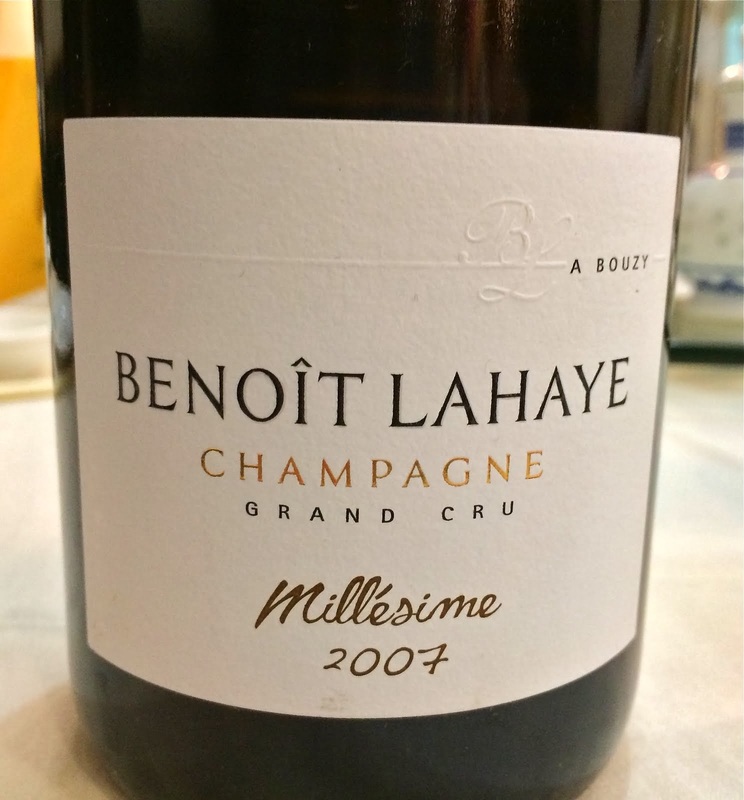 This wine was in magnum format, and was beautiful in its lush fruit and its focused minerality. 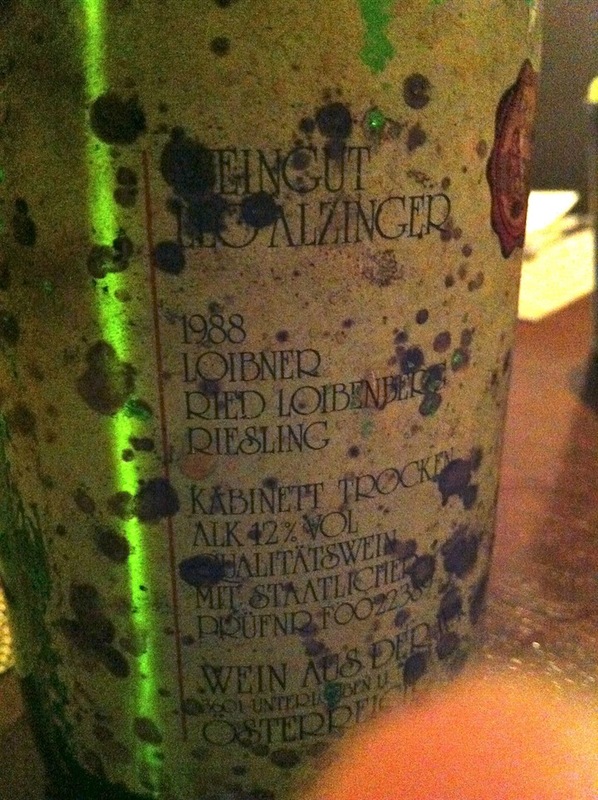 1988 Alzinger Riesling Ried Loibenberg Kabinett Trocken. The wine was in excellent shape, despite the dodgy label. Complex, fresh, vibrant, a real treat and a great advertisement for storing these wines. 2000 Prager Riesling Smaragd Achleiten. I brought this wine and that's why I thought it was so interesting. But it was impressive in its balance and elegance, considering that it was a very hot vintage that in some cases produced some overly fleshy wines. 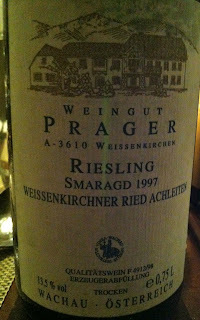 1997 Prager Riesling Smaragd Weissenkirchner Ried Achleiten. I don't know how (or if) Weissenkirchner Ried is different from the regular Prager Achleiten bottling. But this was as fine a wine as any that I tasted on this evening. Rocks, lemongrass, so subtle and wonderful. 2001 Prager Riesling Smaragd Klaus. Intense and very long, and shows how Klaus is so absolutely different in character from Achleiten. More lush in its fruit, more forward and generous. 1997 FX Pichler Riesling Smaragd Kellerberg. Whoa, this wine floored me. Just beautiful wine, as fine as any on this evening, for me. 2002 Moric Blaufrankisch Lutzmannsburg Alte Reben. 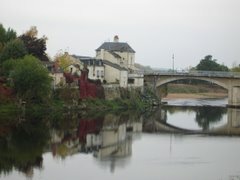 There were several Moric reds and for whatever reason, they didn't show as well as they might have. But this wine was great, so beautifully perfumed. 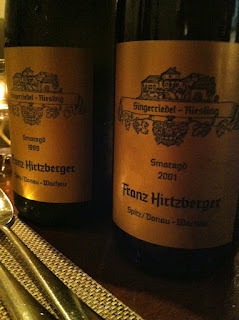 2001 Hirtzberger Riesling Smaragd Singerriedel. Intense and big, but harmonious. I loved this wine. I think I prefer the more gossamer style of Alzinger and Prager, but I love Hirtzberger's Singerriedel. This was such a wonderful evening and I feel lucky to have been a part of it.